10 YEAR ANNIVERSARY PROMOTION: ALL OUR ROOMS HALF PRICE FROM NOV 10 - DEC 24 !!! Do you feel like trying something different? Would you like to stay in an old farmhouse village hostel, beautifully renovated to western standards? A picnic on the top of a karst mountain, a quick evening dip in the peaceful Yulong river or a long walk through the rice fields? At the Outside Inn you are in the heart of the famous Yangshuo activities: cycling, hiking, climbing, rafting, kayaking and a lot more. 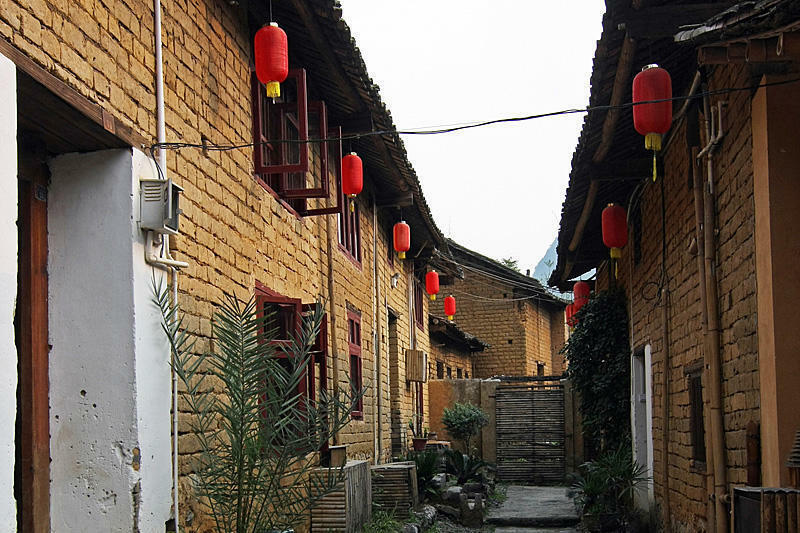 Only 4 km outside Yangshuo, we can offer you a meeting with the past. Chinese village life as it has been for centuries, but a sit-down toilet, clean sheets and wifi in your own private, spacious room or even your own little house. Relax in our gardens, have a cup of freshly ground coffee in our wooden teahouse and a home-cooked Chinese or western meal in our restaurant. Feel at home. We, a well-travelled Dutch manager and our very friendly, professional staff, are looking forward to hosting you! We have many different rooms at the Outside Inn. On our Hostelworld site we only show a limited amount of the rooms, i.e. aircon with twin beds, double bed with fan, dorm bed and the family house. Please contact us for questions on other rooms and rates. And... if you don't want to leave once you get here, at the Outside Inn every 7th night is free of charge. You can reach us by motorbike or taxi (taxis leave from near Yangshuo bus station and cost 25 to 30Y and take about 7 minutes, ask the driver to take you to 'Helan fandian' (Chinese address / name: é˜³æœ”éª¥é©¬æœé¾™æ‘-è·å…°é¥­åº—) or by bicycle or on foot. From the airport there are regular airport busses to Guilin's city center.